When most people visit our house, they don’t quite realize that we have a second floor, which can be accessed through the kitchen (right in the corner nook by the oven of all places). I haven’t really shared a great deal of photos from our upstairs, mostly because it remains untouched, apart from using the closets as storage. I’ve been taking a long break from home renovations, mostly because the upstairs overwhelms me. Pete and I dove headfirst into removing wallpaper, patching, priming, painting, and decorating the downstairs for the most part, but the wood paneling upstairs is still looming. Now that the winter months are quickly approaching, I fully intend on hibernating as much as possible while attacking the upstairs with whatever free time I have. 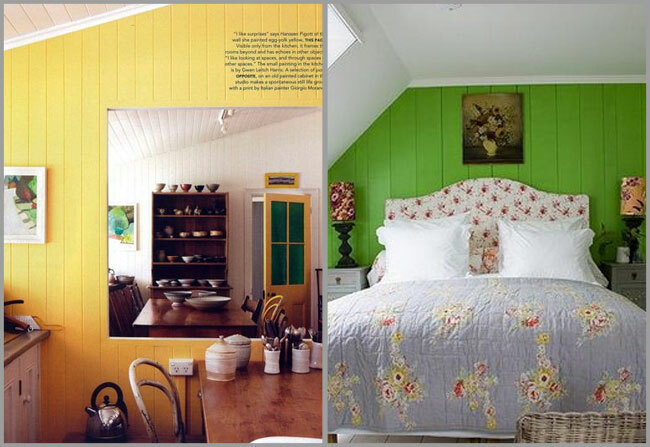 Granted I’m a bit of a 70s girl at heart, the concept of wood paneling has been growing me now that I’ve been seeing such successful painted makeovers. Since we don’t currently have the funds to strip the paneling and replace it with drywall, we have to do the next best thing and paint it. I can hear some of the readers out there gasping at the idea of painting the wood paneling already (I may or may not be talking to my brother here). For some reason, when we tell people our plans to paint the wood paneling they react one of two ways—they either instruct us to rip it down and put drywall up ASAP or they tell us to keep it as is. You’d be surprised by how many people say things like “you should never paint good wood.” Chiiiiild, if this were “good wood” or even real wood, I would think twice, but our paneling resembles wood as much as Cheetos resemble cheese. I’ll admit, I really like the texture the painted paneling lends to our living room walls, but I prefer wood on the floors over the walls any day. 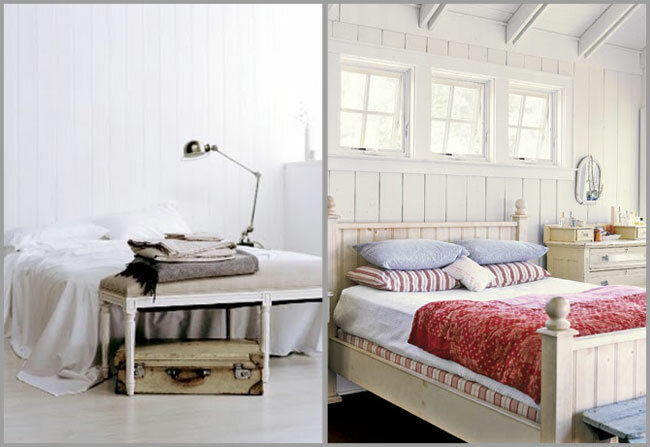 That being said, paneling can give a home a more farmhouse feel if it’s decorated tastefully. 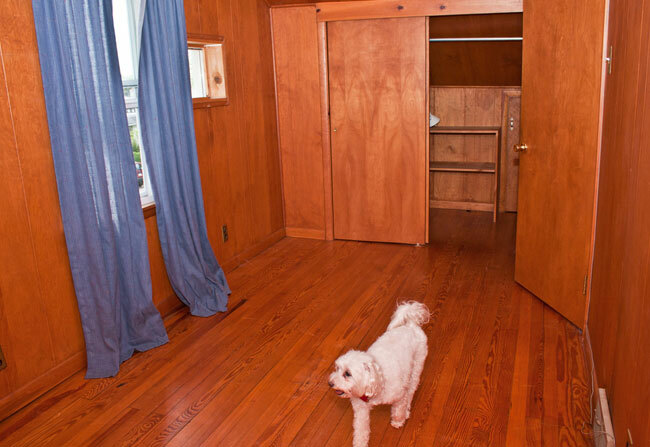 My favorite is when people say “You can never go back once you paint it!” as if I would like to travel back to 1971 to the happier days when people had fake wood paneling installed in their dens. Le sigh. 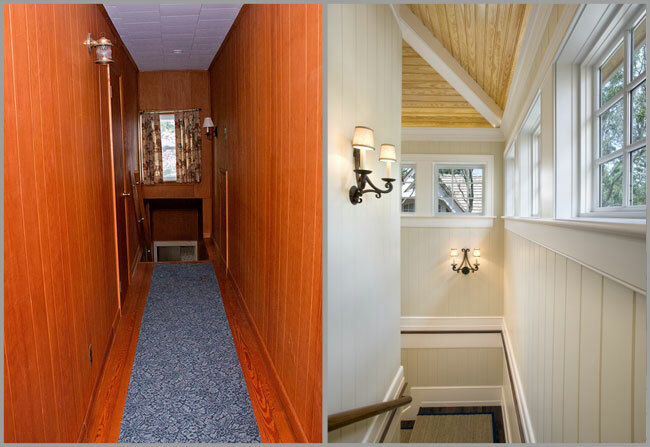 With a little style and personality, wood paneling can go a long way (right), but definitely not in its current state. 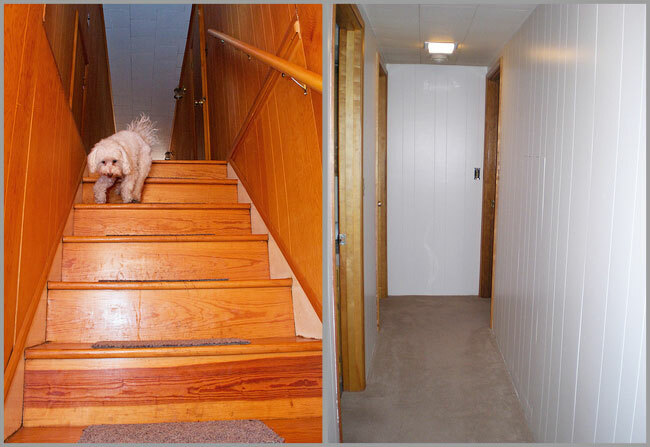 See our above hallway for example (left), which was photographed when we first moved in. We have since removed the hallway carpet runner, but you get the idea. It is like a neverending hallway of wooden misfortunes. I’m sure if Stanley Kubrick had known horror like this existed, he would’ve definitely made a few set revisions to the 1980s classic, The Shining. I may or may not have to start making poorly Photoshopped gifs to illustrate my points from now on. Also, I am really sad that Photoshop no longer offers “Chiller” as a font option. 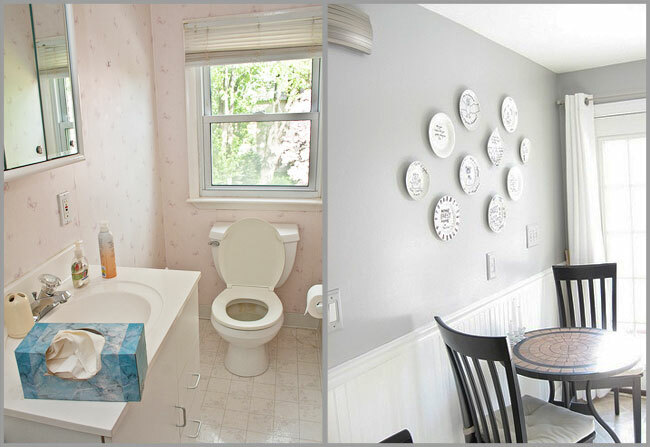 Our upstairs bathroom (seen on the left, as photographed when we moved in, complete with a half-used Kleenex box from the mid 90s) is now wallpaper-less, primed and ready for some paint. I’m quite drawn to the shade of “Chinchilla” by Martha Stewart (right), both because of the pretty grey shade and the fabulous furry critter name. We get a lot of natural light in that bathroom, so I think it would look quite nice. We removed the carpet pieces on the stairs (left), but for the most part, our staircase still looks the same. 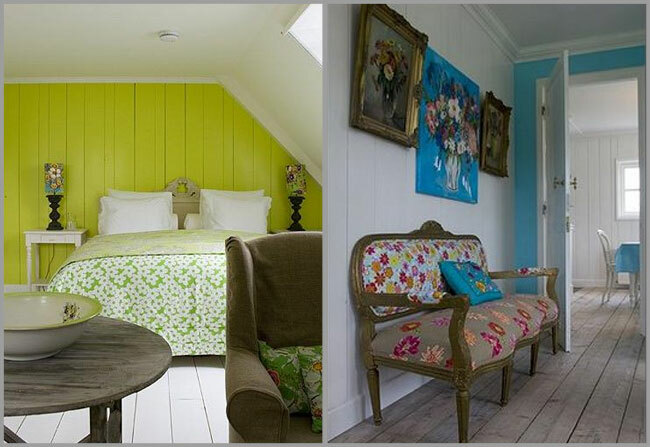 I’m thinking we will prime the walls white and if it looks good as is, we can just give it a few coats of paint and call it a day (like in the photo on the right). The wood room will have to stay as is per my brother’s request until their Thanksgiving visit comes to a close, but I’ve been ooh-ing and aah-ing over the bright painted paneling in the photos below. The slanted ceilings and insides of the closets are even paneled, which are all distracting from the real wood on the floors. Too. Much. Wood. And don’t worry, these photos were taken when we moved in and hadn’t thrown out the previous owner’s curtains..I promise those aren’t ours. Here’s another photo from when we moved in and had yet to remove the old rugs, curtains, etc. I was really psyched to keep these vintage horse curtains, but when I put them in the washer on low, they totally disintegrated. Sad face. They were really smoke-stained and I knew washing them by hand wouldn’t do the trick, but I’m very sad to see them go. That depressing rug, on the other hand, couldn’t have gotten out the door faster. Here’s the upstairs guest bedroom from when we moved in. We cleared out everything except the furniture, which I intend on spray painting white. 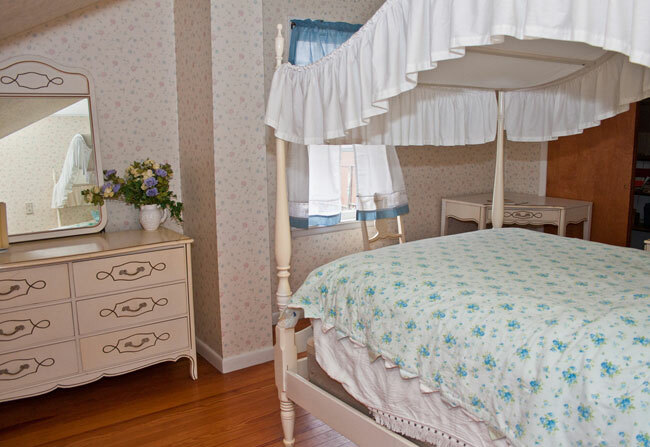 We are going to keep the bed as a four poster, minus the canopy, with more modern bedding (not that there’s anything wrong with shabby chic florals…). 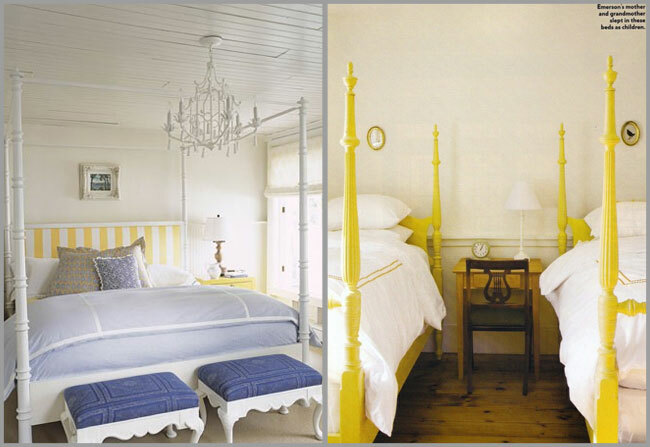 Here are some inspiration pictures I gathered for the upstairs guest bedroom–I like the idea of painting the bed a pop of color, but I will likely stick with white and accessorize with patterned pillows and bedding. Pete seems to be on board with these ideas, so I’m hoping he’ll like the final product. If not, we’ll just have to buy more paint, I suppose. 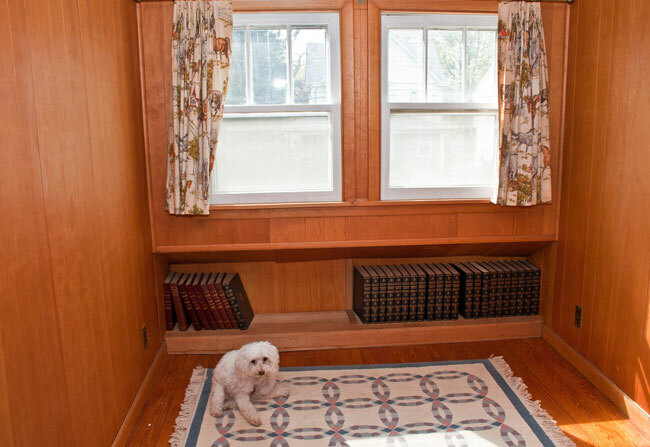 Did any of you have to conquer endless wood paneling and wallpaper renovations?